Flaunt your content and boost your website’s readers’ interaction with the custom Facebook widget from Elfsight. The product is fully responsive with various monitor dimensions, and the comprehensive appearance parameters let it fit in with your service’s layout in an unrivaled manner. Add any kind of Facebook content: page, feed, videos, photos, happenings. Create a high-performance platform, using premium products to draw your users, and take conversion to a whole new stage. Let’s review the widget’s integration and configuration step by step. Fill out your unique Elfsight Apps profile or log into your account. Click on Facebook Feed in the list of offers. Indicate the plugin’s configurations and style. Pick a plan, you’re granted different kinds: from a free one to the premium one. Copy the plugin script to show on your web-resource. 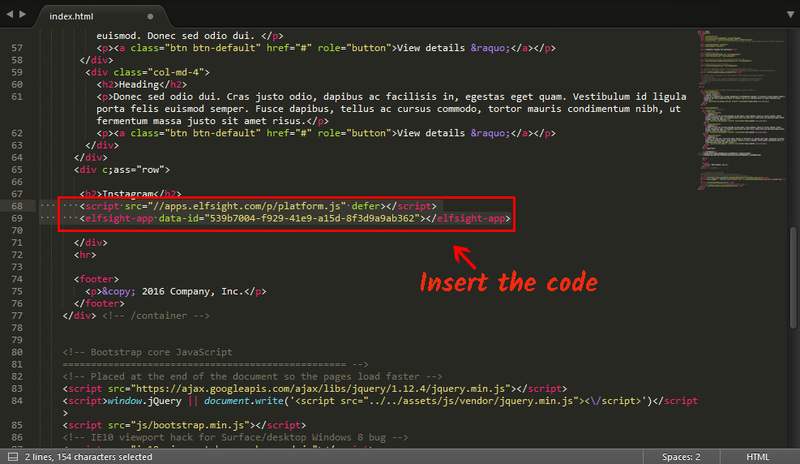 Go to editor and install the widget code to the required block. Save the results and upload the page to the server. • Facebook widget has been installed! The code installation is complete. After you embed the widget, you can shape it from your own Elfsight Apps account. You only have to rearrange the parameters in the editor and save the changes. All the corrections will be automatically installed at your website. Allows to display any social content. Get more information on the HTML Facebook plugin page. A platform developed to allow the current platforms made with different engines to work in a more efficient way. Check out the Facebook widget online demo for free! Test all the Facebook specifics for HTML site right away.